I found this recipe online through youtube, it’s super simple and yummy! Food process first 4 ingredients until it forms a thick clumpy consistency. 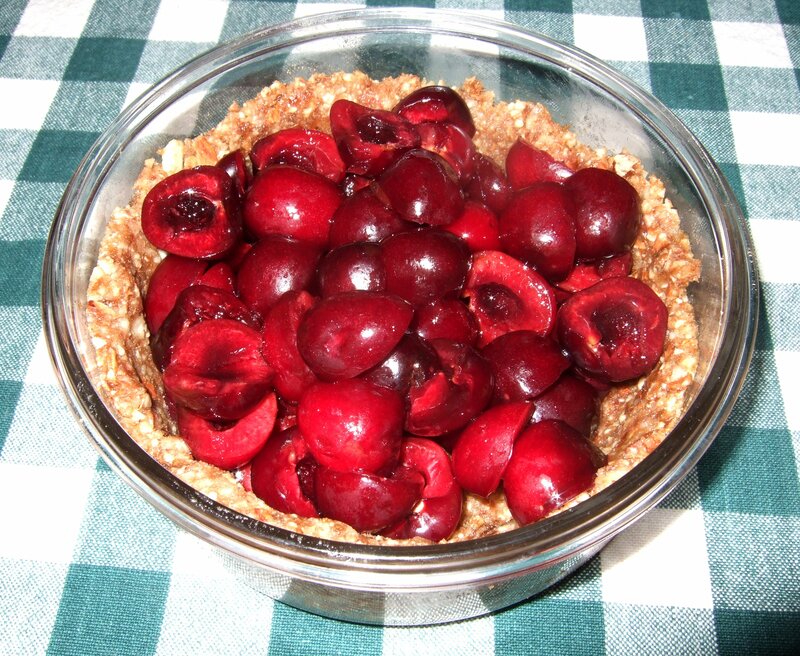 Form into crust and add pitted cherries. I’ve been really busy the last few days and my lunch has been provided, hence me slacking with the bentos. But I’m back at it today! I made this bento this morning and it only took about 10 minutes total putting it together. I used a piece of cloth that I hand dyed for my psychology of clothing class last semester. It’s a cool technique where you rubber band marbles in the cloth and dye it. I put it in blue then red dye to make it that color. I still need to finish the edges, but I thought it would work well for today. Now onto the bento! On the left there’s some cut up celery, baby carrots, cherries, a fortune cookie and a few peaches from our tree. 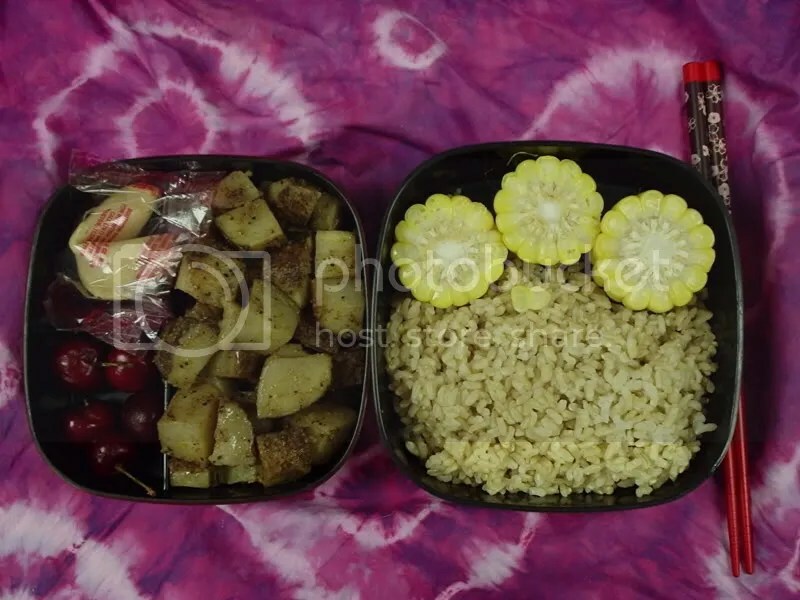 For some reason the peaches were really small this year, but they fit perfectly in the bento! On the right I have some mushroom flavored udon noodles I made. They came in a package similar to ramen. I added some miso paste and sesame seeds into it to add some extra flavor. 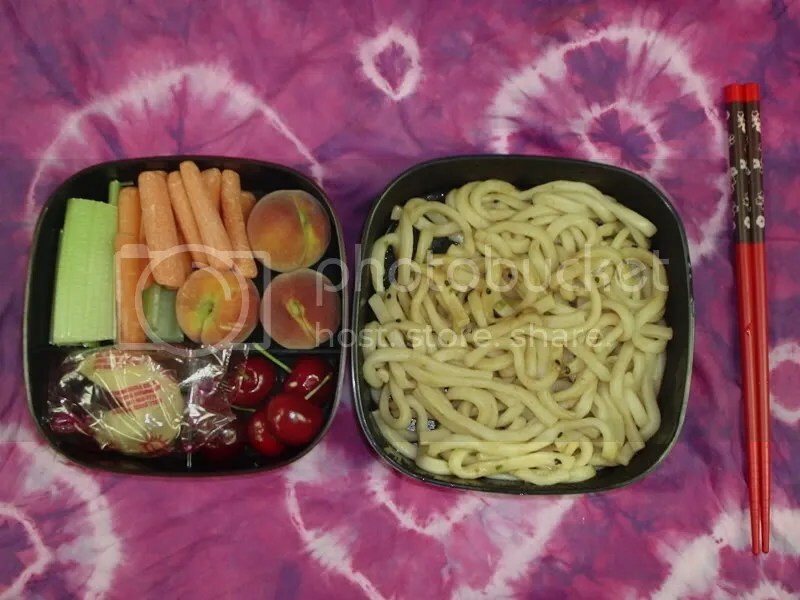 I haven’t eaten the bento yet, but I tasted the noodles and they are yummy. Adding miso to asian style noodles is a new way of flavoring noodles that I came up with a few weeks back. It is an easy way to change up the flavor.